He noted that the JA program is designed to help prepare our young people for the real world, by demonstrating to them how âto generate wealth and effectively manage it and how to create jobsâ. He is optimistic that the programme will help to build a solid base of âyoung knowledgeable entrepreneurs and business people filled with initiative and new ideas to be strong business leaders of tomorrowâ. While giving an overview of the Junior Achievement program, Safia London, Business Development Officer at SVGCIC, said the programme was started in the United States in 1919 and is recognized as âan effective provider of business knowledge and skills to local studentsâ. She stated that since Junior Achievementâs introduction in St Vincent and the Grenadines in 1997 by the Rotary Club, hundreds of enthusiastic students have benefitted. London said the fourth form students will get an opportunity to develop a business of their own where they will purchase and create products for sale. According to London, all business functions will be carried out by an executive, who will have responsibility for the various departments, including Marketing, Production and Finance. She mentioned that students are expected to meet twice weekly for business meetings where they will decide on the plans and aspirations of their business. London said this exercise will give students the opportunity to learn the âins and outs of the business world, equipping them to function when they eventually enter the job marketâ. She thanked the Board of Directors of JA Advisory Board for helping to restart the programme which went dormant for close to two years, and expressed the hope that by next year, they would increase the number of participating students. London urged all the participants present to âgive it your all in order to reap the rewards of the programmeâ. 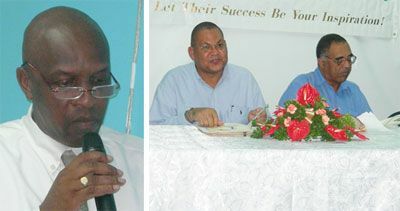 Senior Education Officer for Secondary Schools Carlton âCPâ Hall and Geoffrey Hadaway, Chair of the JA advisory board, gave brief remarks in which they both urged the students to learn as much as they could from the program. The Junior Achievement is a world- wide organization whose aim is to raise the economic literacy of future consumers, voters, employers and entrepreneurs. In this yearâs programme, eleven secondary schools in Kingstown and its environs will participate in the three-month programme.